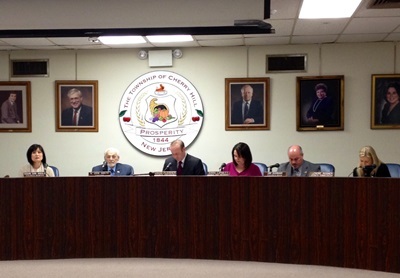 (Cherry Hill, N.J.) – Township Council on Monday night adopted a new Complete Streets Policy that will make Cherry Hill’s roads safer and more accessible for everyone, Mayor Chuck Cahn has announced. The new initiative will, over time, create a comprehensive, integrated multi-modal transportation network by facilitating connections to bicycling and walking in all of the Township’s future street and sidewalk projects. The implementation of Complete Streets fulfills a main objective of the Township’s Bicycle and Pedestrian Master Plan, which was adopted by the Planning Board in early 2013. It establishes a checklist of potential pedestrian, bicycle and transit accommodations such as sidewalks, bicycle lanes, crosswalks, pedestrian control signalization, curb cuts, crosswalks, and other traffic-calming measures that must be considered, when feasible, in the planning, design and implementation of future road improvements. “By improving access for everyone, Complete Streets enhances safety while promoting a healthier community and a cleaner, greener transportation system with less traffic congestion and improved air quality,” said Mayor Cahn. Potential projects will be reviewed against several factors to determine whether Complete Streets design is appropriate, including the road’s function, traffic volume, adjacent land use, and environmental and cost considerations. Projects in which Complete Streets improvements would exceed 15 percent of the total cost are exempt from the program. An advisory committee comprising representatives from the Township’s Engineering, Public Works, Community Development and Police Departments, as well as a representative from the Mayor’s Office, will evaluate each project. Mayor Cahn noted that accessibility enhancements have already been incorporated in some areas as part of road-improvement projects, including the installation of bike lanes on Kings Highway last year in cooperation with Camden County. Complete Streets also underscores Cherry Hill’s status as a Healthy Town and the mission of the Cherry Hill Mayor’s Wellness Campaign, which encourages residents to get moving and stay active.